The good things about the Pinnacle Hiking Poles are that they are cheap, fairly light, and you won’t cry when you break them. If you’re a serious hiker, investigate the higher quality poles and save these for your “leave in the car” set. Each pole can be extended to any length from 25.5 to 53 inches in length. These are very similar to the BAFX poles reviewed here. The poles extend by turn locking system and each pole has measuring on the middle section for easy adjustment to your preferred height on every trip. They also have a durable steel tip hidden under the rubber foot at the bottom for trekking on more rocky and uneven terrain. The slender Pinnacle anti-shock hiking / trekking poles are made of aluminum alloy and weigh around 10.5 ounces. These are lighter than the BAFX trekking poles and the quality is a little better. The handles are plastic, which is great for durability but not so great for “give.” Some owners though a different material would have made them more comfortable. As is common, there’s an adjustable wrist strap but there are no foam grip areas below the handle for carrying the poles when not in use. 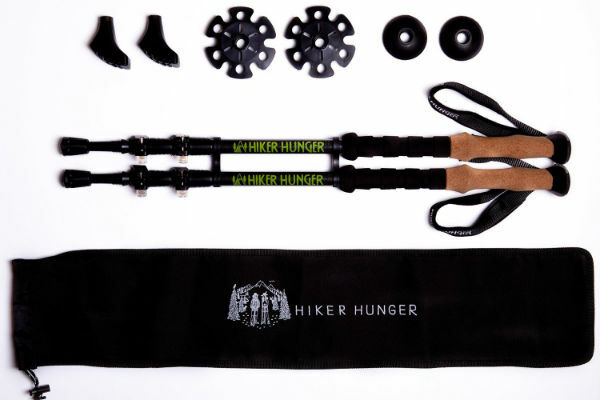 In terms of adjustability and features, the Pinnacle hiking poles are much like the Neewer, Hikker and BAFX products we have reviewed. The same kind of turn and lock device allows you to open and close the poles between 25.5 and 53 inches. The anti- shock mechanism absorbs energy from your upper body and provides stabilization to prevent wear and maintain. Anti-shock feature can also be turned off for a greater sense of contact with the environment. Each hiking pole is fitted with a metal tip and a rubber cover. You also get a spare pair of covers with this product – presumably in case you do a lot of road work and wear them out! The removable snow disk is perhaps a bit more robust than others, but in the end, it does the same job. Pinnacle hiking poles are popular but not as popular as the BAFX trekking poles. Consumers love the cheap price. The poles are very good value for the price. They’re lightweight, sturdy and adjustable. You can also turn on and off shock absorbing feature based on if you’re going up or down hill. The Pinnacle poles are designed for moderate trekking, but owner feedback suggests that some have pushed them through quite difficult terrain and come out the other side still smiling! A few found the handles uncomfortable in hot conditions, and the twist locks also receive some criticism (this seems to be a common occurrence, regardless of manufacturer). On rare occasions, the carbide tips and rubber ferrules have been known to fall off, but this is uncommon. At first glance, there’s little to separate the Pinnacle hiking poles from the BAFX Products trekking poles. They share a similar design and have a similar extension range. Both have anti-shock systems, and both lock via a turning collar. 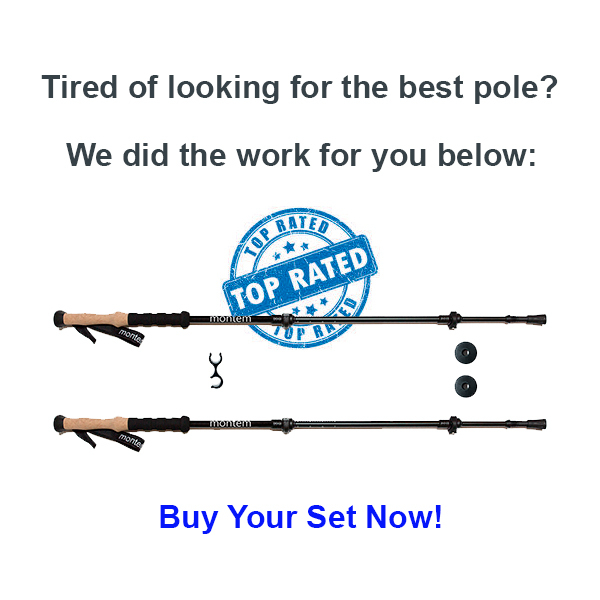 The only difference appears to be that the Pinnacle poles seems to be better quality and more sturdy than the BAFX Products trekking poles. According to our research, Pinnacle hiking poles are considerably more popular. Indeed, customers are highly satisfied with their Pinnacle hiking poles. You can purchase them only at Amazon.com here. The adjustment process is fairly tedious, and we found ourselves adjusting them pretty often (maybe 30 times over the course of 3 hours). The handles were not comfortable, and we have some blisters forming. We have concerns about the quality and use of these poles over the long run. Not sure they are meant to last. They are cheap and low quality and we would not recommend for any serious hiker.